Ex-marine, Mallory Kane (Gina Carano) is a highly skilled operative working for a government security contractor. After rescuing a Chinese hostage, she realises that she has been double crossed. Mallory is a dangerous woman to cross - let alone double cross. Determined to find out why she has been betrayed, she embarks on a high stakes revenge mission in order to clear her name. Only one thing is certain - she does not want to run anymore. Click Here To Receive Our Weekly Movie Newsletter! I really, really enjoyed Haywire. Yes, you could argue that the plot holds nothing new. Yes, you could also argue that the end - when the story is finally unraveled - doesn’t quite satisfy. However, I just loved watching Mallory Kane kick some serious A.
Mallory is played by former mixed martial artist, Gina Carano. The story goes that director, Steven Soderbergh saw Carana fight and then decided to build a movie around her and her awesome skills. As a result, Haywire features some brilliant fighting scenes. They look so natural and not stagey like so many fight scenes tend to do these days. I was just mesmerized by Mallory’s skill and athleticism. Mallory has to fight a series of men and they don’t hold back. This is a bit of a shock at first as the violence is pretty brutal (and starts very early on) but you soon realise that Mallory is more than a match for most of her opponents. 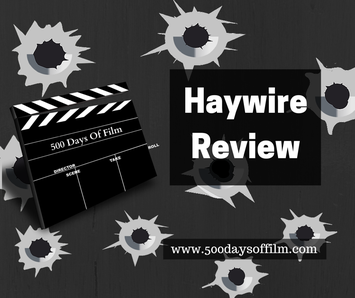 Haywire is also great fun as a result of its impressive cast. All give good performances - Ewan Mcgregor, Channing Tatum and Michael Douglas are particularly enjoyable to watch. However, I could have happily forgone all the stellar cast and just watched Mallory fight for hours. Haywire - brilliant fighting fun. Michael Douglas has the most fabulous voice don’t you think? I loved the father/daughter relationship in this film. Have you seen Haywire? What did you think of this film? I'd love to know - just leave me a comment in the section below!